Ever walk into the electronics section of your local retail store like a Target or Wal-Mart and see a bunch of Ethernet cables, but with different names and specifications? What is the difference between these cables and what makes one better than the other? In this blog, we will explore the differences between Cat5e Ethernet cables and Cat6 Ethernet cables. Like all commodities, bigger better versions come out after the product has been through its lifecycle. In the case of Ethernet cables, Cat5e is your standard Ethernet cable that has bandwidth performance up to 100 MHZ. Now Cat5e is the enhanced version of Cat5, hence the “e” added to the end of the name. With Cat5e, crosstalk characteristics are minimized through the twisted pairs. Crosstalk, as mentioned back in one of our earlier blog posts, is when a signal on one circuit or channel is superimposed on another and causes some kind of interference. Cat6 Ethernet cable provides even better crosstalk than Cat5e cables, but the performance is rated at 250 MHz which allows Cat6 cables to deliver double the signal-to-noise margin of Cat 5e cabling. In addition, these cables also provide the performance headroom desired by end-users to ensure that their cabling plant can withstand the rigors of the cabling environment and still support 1000BASE-T standards. Cat6 cables are often used in more industrial environments and not in the home as they are rated for 10 Gigabit Ethernet standards. 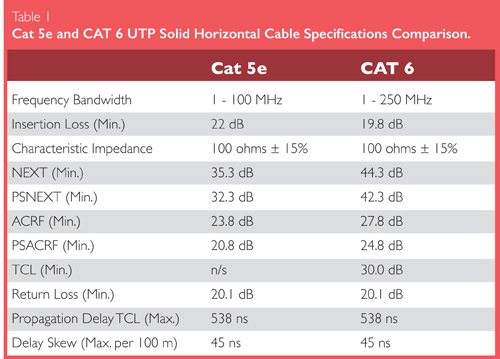 Generally speaking, Cat 6 cable has wider frequency bandwidth and tighter requirements on electrical performance. Now when you see Cat5e and Cat6 Ethernet cables, you can distinguish the difference with crosstalk and performance characteristics.